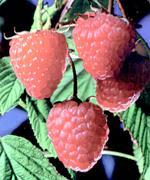 The raspberry is the fruit of the raspberry shrub or bramble. This plant grows wild in several regions of Europe, although it is also cultivated, becoming quite an important crop. It is a small, conical or round fruit with a velvety red or yellowish skin. The pulp is very aromatic and has a bittersweet taste. It is eaten raw or used to make jam, jelly and drinks. It is also found frozen. 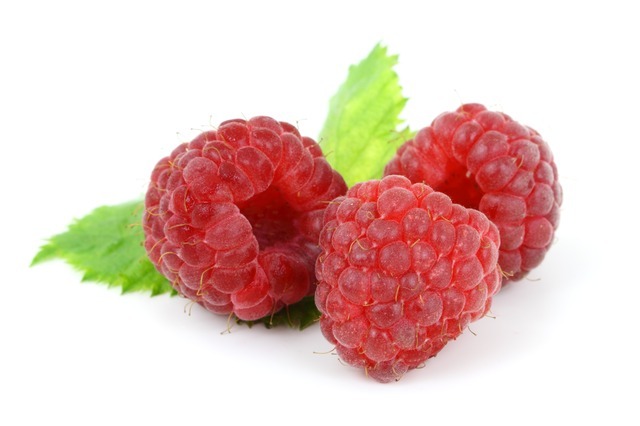 Raspberries provide with potassium, iron and calcium. They have a low content of sodium. The content of vitamin B3, C and folic acid is quite significant, although it also contains vitamin A, B1, B2 and B6. It has a low content in proteins and fats, and it is tolerated by diabetics, since it has an adequate level of sugar. It also stimulates appetite. 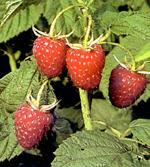 The raspberry (Rubus idaeus) is the fruit of the raspberry shrub or bramble. This plant grows wild in several regions of Europe, although it is also cultivated, becoming quite an important crop. It is a small, conical or round fruit with a velvety red or yellowish skin. The pulp is very aromatic and has a bittersweet taste. It is eaten raw or used to make jam, jelly and drinks. It is also found frozen. In fact, this fruit is made up of multiple small and round drupelets, each one of them containing a seed, gathered in a small conical receptacle. They are known as the forest strawberries and their taste is very pleasant although it looses intensity a few hours after the harvesting. The cultivated varieties are usually larger but with less aroma and taste than the wild ones. The output is also greater and they produce more juice than the latter. Raspberries have a moderate amount of glucids. Their content of protein, lipids and energetic value is also low, 26 kcal for each 100 g of fresh produce. It is a highly perishable fruit. In order to increase their preservation they are kept in the fridge for 2-3 days. Besides, they can be frozen. The optimal relative moisture ranges between 90-95%. Fresh raspberries are usually consumed alone or with cream. They are also used in confectionery, to aromatize desserts or to prepare juices and brandies. The raspberry juice is used to improve the taste of chemists drugs. This juice, diluted in water, becomes the raspberry refreshing drink. Raspberry jam and liquors are also made from this fruit. The red and large varieties with few seeds are used for all these applications. Raspberry (Rubus idaeus) is a perennial bush of biennial cycle that blooms and fructifies during the second year. Afterwards, the aerial part that has fructified dies, and is replaced by new shoots. The shrub measures 40 to 60 cm high and grows in the stony areas of the mountains, in granitic land. The stems are woody-like and straight, prickly and slightly whitish due to the frosts. The stems are so prickly that they are often used as fences. Some long and thin roots grow from the rhizome; they have an absorbent abundant hair that does not go very deep in the ground. These roots bear some vertical shoots that will give rise to new plants. The leaves are alternate, formed by 3, 5 or 7 oval and pointed folioles with sawed edges. Each one of these leaves measures 5-8 cm, has a rough surface with well-marked nerves, a lively green adaxial and a silver-coloured abaxial. The petiole is long and provided with bent thorns. The flowers are pentamerous, white and small, with a multiple ovary and many stamina and visible pistils. They are gathered in small bunches in the axil of the leaves grown in the two year-old branches. The fruit is called raspberry and is formed by a group of small globose drupelets. Each one of these drupes contains a seed and is placed inside a white and pulpy receptacle which is removed quite easily when it is ripe. Maturation begins in June, and parallel to the flowering, the fruit ripens in a scale like form.